For those of you who like the resorts in mountainous areas, there is no harm in visiting this plateau. Plains known as the Dieng Plateu is situated at an altitude of 21:00 m above sea level. This place offers the natural beauty and chill pegunungan.Dieng Plateu a vast plain surrounded by mountains, including Mount Prahu, Mount Juranggrawah, Mount Pangamun-amun, Mount Sipandu, and several other Mt. No wonder if the air temperature in this area ranges between 15 degrees -10 degrees Celsius. In fact, if you visit during the dry season the temperature may reach 5 degrees Celsius. The name "Dieng" comes from the combination of two words in Sanskrit, is "in" which means "mountain" and "hyang" from the word "Khayangan", which means "abode of the gods and goddesses". When combined, the name "Dieng" means "mountain abode of the gods and goddesses". But there is another source that says, "Dieng" comes from the Javanese, the "edi" which means beautiful / gorgeous and "Aeng" meaning strange. So "Dieng" means "beautiful place and have a strangeness". Plateu Dieng area has several attractions that you can visit, where it is adjacent to each other. In addition to natural attractions such as lakes and craters, you can also visit the historical attractions of the temple.Once entering the main gate at the Dieng plateau, you will be greeted by a temple complex called Pandava temple. This complex contains five temples, the temple Semar, Arjuna, Heroine, Sembadra, and Puntadewa. The temples are scattered across the region patterned Hindu. According to stories circulating in the community, in the 7th century AD there was a princess named Dewi Sima. He is a descendant of Sanjaya dynasty who ruled the kingdom of Kalinga, the title of Queen Sima. The kingdom is known as a Hindu kingdom breath. During his reign, the Queen Sima establish temples in this place as a form of worship. Queen Sima not only founded a temple complex. But he also founded several other temples, including Temple is located on a hill Ghatotkacha Pangonan, Dwarawati Temple at the foot of Mount Prahu, and Bima temple which is the largest temple in the tourist area of ​​Dieng Plateu. The temples which are generally located outside the compound alone and surrounded by trees. 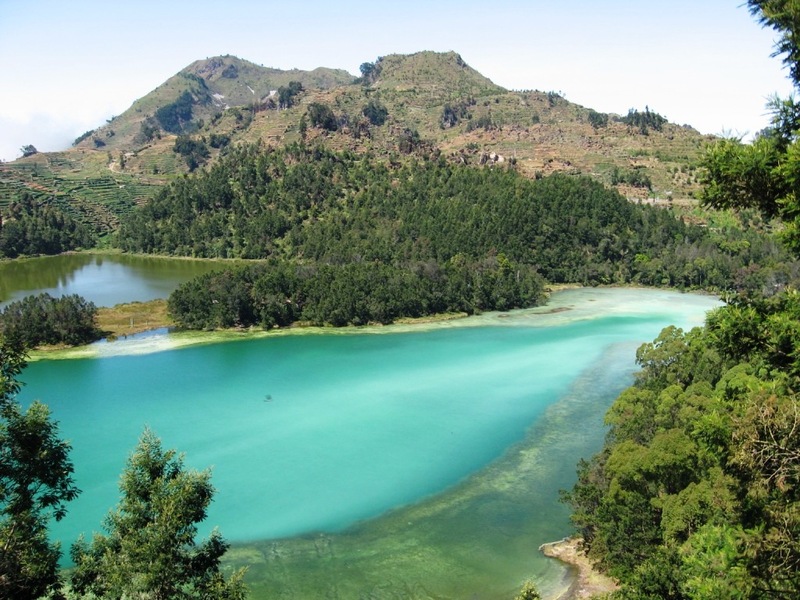 Famous natural attractions in this place is Telaga Warna and Lake Pengilon. Both were located adjacent lake. Telaga Warna lake named because it reflects a variety of colors. Sulfur content in it reflects the color green, whereas red algae are based lake reflects light pink and crystal clear blue water lake that emerged from the reflection of sun shades. The name itself means Pengilon lake lake mirror. The water in this lake is very clear and could reflect the shadows of objects in the vicinity. In the area attractions and Telaga Warna Lake Pengilon there are also several caves. One of them is the Cave of Semar. Its length is about 4 m with stone walls, and is usually used to meditate. Semar Cave In addition, there is another cave bebarapa namely, Caves and Cave Jaran Wells. Inside the cave there is a wellspring Wells called 'Tirta Prawitasari ". 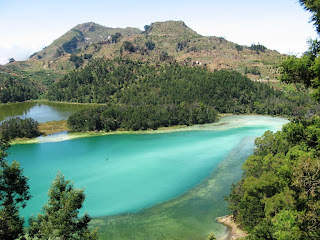 In addition to the lake and caves, in Dieng area Plateu there are also several craters. Craters are formed from the eruption of the mountains that surround this place. One is Sikidang Crater. The crater was belching hot mud and water and remove the smell of rot coming from the sulfur content in it (sulfur content in the crater is still being safe for visitors). Around this place there are many holes that emit hot water mixed with sulfur, so you should be careful when walking. In addition Sikidang Crater, there is also a crater and crater Candradimuka Sileri, which was situated not far from Crater Sikidang. In the tourist area of ​​Dieng Plateu there is a spring known as the source of the river's Serayu, named Tuk Bimalukar. "Tuk" is derived from the Javanese word meaning springs, while the "bimalukar" is taken from the myths that circulate in this area. The residents believe that the spring is derived from the urine Bhima Sena (figure Pandavas in the puppet) who were competing with the Kauravas to make a river. At the moment she opened her clothing, Bhima Sena see beautiful women who bother him and he said "sira ayu" (in Indonesian have the meaning "you're beautiful"). After that, urine Bhima Sena became a spring and a source of the River Serayu (Serayu name comes from the word "ayu sira" he was saying). According to the beliefs of the population, the water that comes from Tuk Bimalukar can lead to eternal youth. After being visited natural attractions and history, you can also watch the movie lasted about 20 minutes in Dieng Plateu Theater. The location of this theater on the hillside Sikendil, approximately 300 m from Telaga Warna. Here you will witness some events that have occurred in the Dieng Plateau, one of which is a tragedy Crater Sinila events in 1979 that killed hundreds of Dieng. Means provided by the manager of a tourist attraction Plateu Dieng is beneficial for those who are interested in the history of Dieng.But for those of you who still want to visit tourist attractions are not far from the Dieng area Plateu, try to visit Tambi tea plantation. In this place, you can not only look at the green expanse of tea tree, but can also enjoy a dish of tea produced from the plantations. Tourism destinations in Dieng area is managed by two District Plateu namely, Wonosobo regency and district Banjarnegara. Although the actual Dieng Plateau lies between the borders of three districts, namely Pekalongan Regency, Wonosobo district, and Banjarnegara Regency, Central Java Province, Indonesia. Access to the Dieng Plateau is easier if taken from Wonosobo city, because the road can be traversed in motor vehicles. But if you plan to bring a private vehicle, do not forget to make sure that your vehicle is in good condition. This is due to road terrain to be traversed is quite winding and uphill. Not infrequently in the right or left edge of the road adjacent to the abyss.But if you want to ride public transportation, you can depart from Wonosobo city terminal and a distance of approximately 30 miles to the journey time is 45 minutes-1 hour. Cost to be paid about Rp. 7000.00 / person (November 2008). The ticket price to enter the tourist area of ​​Dieng Plateu Rp. 2000.00 / person. This price does not include tariffs visited tourist resorts in the surrounding region. Price tickets for admission to all attractions Rp 12,000.00 / person, and include insurance Raharja Services. Especially for you who want to visit one or two specific objects tickets are priced at Rp. 4000.00 / person for single attractions (November 2008). Facilities that you can use in the tourist area of ​​Dieng Plateu is praying for the visitors who will perform the ritual prayers. There is also a market place selling souvenirs and typical food products Dieng, such as vegetables, fruit Carica (the fruit is grown only in the Dieng plateau, the shape is smaller than papaya, usually processed into sweets and typical mushroom Dieng). The market is supplied by the manager to pamper the visitors who want to shop.In addition to the market, in this region there are also many food stalls for visitors who forgot to bring food from home. For those who want to spend the night, in this place are also many options available flights / hotels, with a variety of facilities offered.